Welcome to Fully Funded Public Speaking Workshop. We are grateful and appreciate your interest in visiting this page to understand and apply for the workshop in detail. Public Speaking is one of the prominent soft skill required in an individual for any kind of career or life goals. The program is focused to nation-wide youths where only 12 selected applicants will have the opportunity to take 18 hours (2 days and 2 night) of public speaking workshop. The program is organized by Landmark Education Pvt. Ltd. in partnership with Glocal Pvt. Ltd. The program will be held in Kathmandu on 9th and 10th of February, 2018. Please note that photos, videos of the workshop of selected participants will be displayed in partner website and social media channels. Participants will have to reach to the program venue on their own and only the Accommodation, Fooding and Program is funded. 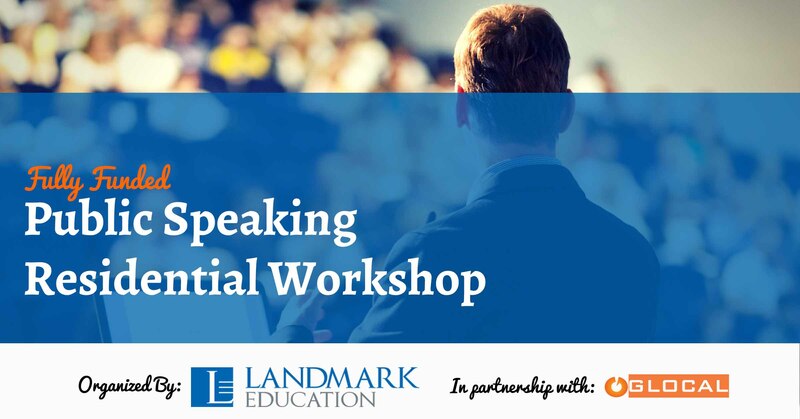 We are glad to invite the selected participants to Fully Funded Public Speaking Workshop Organized by Landmark Education and Designed by Glocal Pvt. Ltd. We are looking forward to welcome the selected participants at Park Village, Budhanilkantha, Kathmandu on 9th February, 2018, 10:30 AM Sharp. The program is 2 days 2 nights workshop on Public Speaking by an International Trainer, Mr. Joy Chaudhary, on 9th and 10th. We request all the selected applicants to please come with an Identification Card and a mentality to learn in the process.